Background: Two pristine parks encompass breathtaking scenery, from 1,500 foot chaparral and oak foothills to a granite wilderness that includes 14,495 foot Mount Whitney, the highest peak in the lower forty-eight states. Black bears and mule deer feed in the meadows. California bighorn sheep can be spotted near Rae Lakes during summer and fall. Gray foxes, yellow-bellied marmots, and squirrels are common, as are aquatic garter snakes and western rattlesnakes. Golden trout inhabit the Little Kern River, More than 200 bird species, ranging from nuthatches to goshawks. The parks have been designated an international Biosphere Reserve. Giant sequoia groves, including several of the world's largest trees. Native American pictographs and village site at Hospital Rock. The Kings Canyon, a glaciated valley described by John Muir as 'a rival to Yosemite'. The Habitat: Wildlife habitats include three river systems, alpine lakes, gushing waterfalls, rugged canyons, glaciated valleys, meadows deep in wilflowers, dense conifer forests, and groves of ancient sequoias. The Experience: White-headed woodpeckers, Clark's nutcrackers, Cassin's finches are seen year round. Songbirds are best viewed in spring, including western tanagers, lazuli buntings, and black-headed grosbeaks. Bears are common from May to November. Look for deer at middle elevations during summer, in foothills during winter. 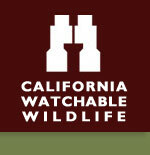 Wildlife viewing changes with elevation. Viewing Tips: Five visitor centers. Limited roads, 700 miles of trails. On Pacific Crest Trail. DRIVE CAREFULLY, WINDING ROADS. Seasonal: The Grant Grove area of Kings Canyon National Park and the Foothills and Giant Forest areas of Sequoia National Park are open 365 days/year. The Mineral King area of Sequoia and the Cedar Grove area of Kings Canyon are open during the summer and fall. The road between Sequoia and Kings Canyon may be closed during the winter due to storms. How to Get There: For Kings Canyon, take Highway 180 east from Fresno. For Sequoia, take Highway 198 east from Visalia.